It’s the second month of the new Meet and Eat event, and its popularity is growing! The slight rain didn’t deter attendees, and as usual, there was a lot of food trucks with skillets, pans, ovens, and stoves all ready to cook up a feast! We were there to capture the sweet cars that rocked up. Here’s our picks for April! 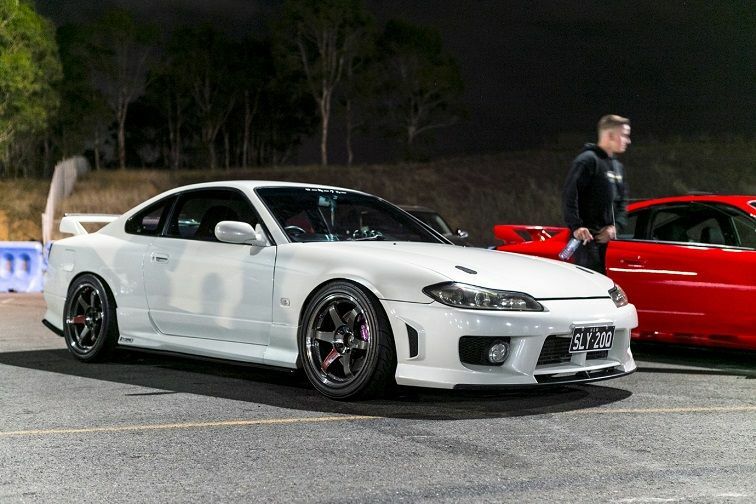 The Nissan Silvia S15 has such classic lines, and are slowly getting rarer and rarer. Luckily owners have been keeping them in tip top shape, with tasteful and functional modifications. Callum’s Japanese-spec S15 here has most of the fruit right out of the box; the genuine and rare optional Nissan body kit, complimented with JSAI sideskirt and pod extensions. It sits on 9.5in wide TE37SLs, showing off the Brembo calipers up front. The carbon Varis bonnet has been painted white for a stealthier look. Under that expensive bonnet lies the venerable SR20DET. The head has been built to handle a Garrett GTX2867 on an E85 setup. Inside, red Recaro SR4s hug the driver and passenger, while a complement of Defi gauges lets Callum keep an eye on the engine condition. There’s always a special one that rocks up to these meets. 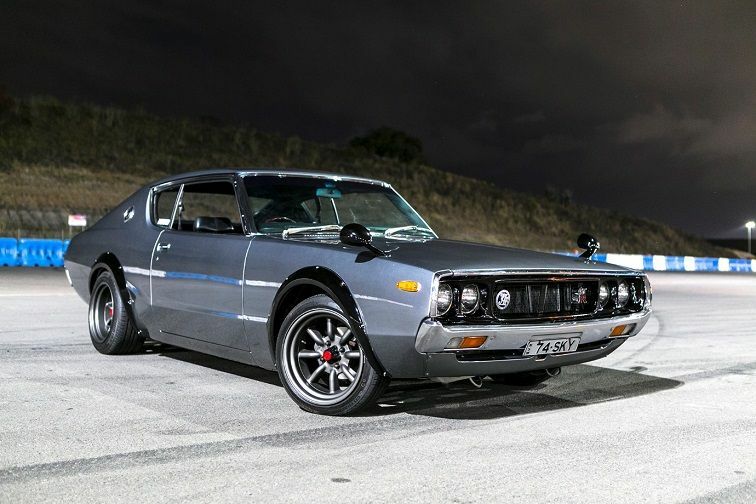 Meet this special one; a 1974 C110 Datsun Skyline, restored immaculately to Brad’s taste. 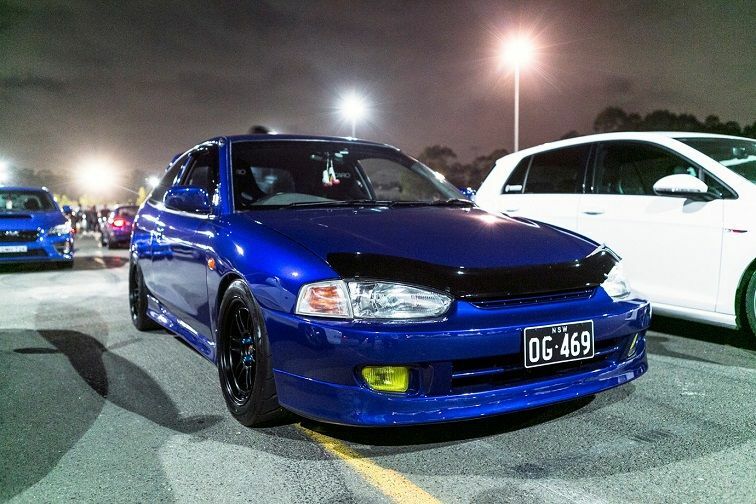 Originally a 240K sold in Australia locally, Brad found it in pieces and slowly put it back together over five years. Production Automotive took care of the L28, rebuilding with triple Webbers for that glorious straight six noise, before it went back into the repainted engine bay. All the rust was removed before the car was sprayed in Nissan Pewter Silver. To accommodate the super low offset Watanabe wheels, bolt on flares were used for that period correct look. Making a very noisy 190rwhp, Brad’s classic Skyline is a treat for the senses. 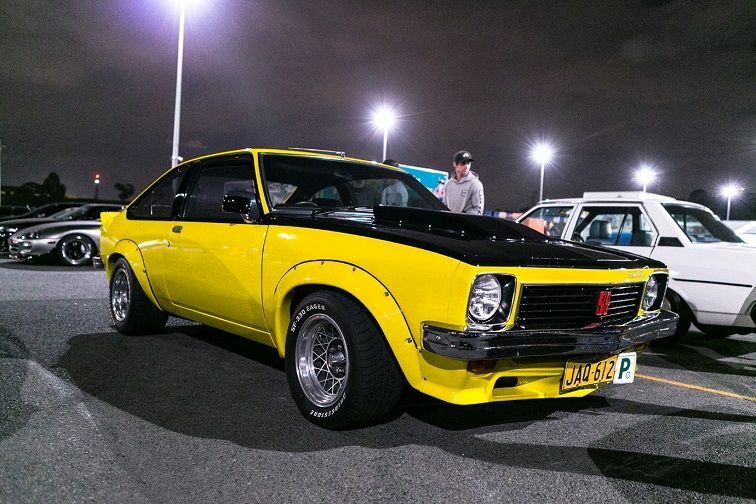 You see all sorts at meets, like P-platers that show up in the dads’ flashy weekenders driving like its theirs. Fortunately for us, Bayley’s dad has a very interesting weekender, and he does straight up admits that it belongs to the parent unit. Born and bred red through and through, Bayley and his family loves Holdens, especially the special vehicles’ department. This is a special toy, kept in concourse condition. Other than a brand new T5 gearbox, console, and custom exhaust, the car is left untouched. It still runs the original 308cu V8, has matching numbers on all parts, and the number plate was transferred over from a scrapped 1976 Chrysler Sigma. Even the paint is original! When one door closes, another door opens. Josh was dead set on getting a Toyota Supra as his first car, but when his parental unit said no, he didn’t kick up a fuss. 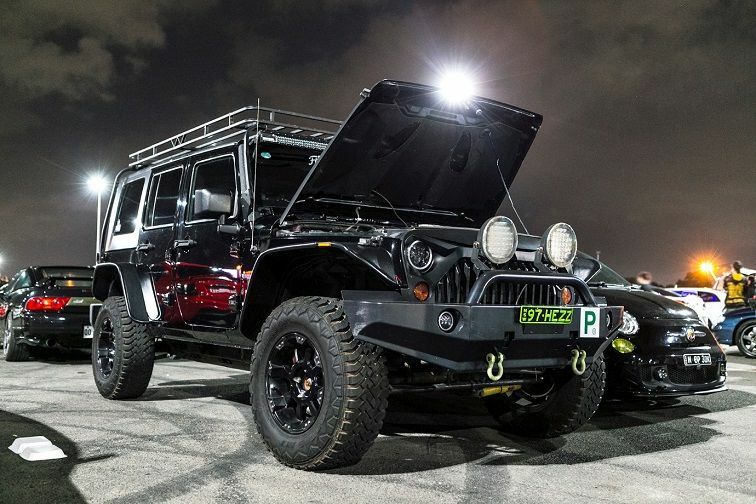 He decided that the next best thing would be…a Jeep Wrangler. Those scratching their heads will understand, once they find out that the Jeep has an aftermarket parts catalogue that’s thicker than a telephone book. Except for the rear bar and side steps (Josh has that on his list), nothing has been untouched in the Wrangler. A high flow catalytic convertor and exhaust liberates that glorious 3.8l V6 note. Quad tailpipes add a sporty look, and a tune lets it churn a healthy 220hp and 300Nm at the wheels. Aftermarket fenders, custom halo lights and grill gives it a distinct look. The bulbar, spotlights, light bar, and roof rack are handy when Josh takes it off roading, along with the 2in lift kit. 33in tyres on 17in rims not only work well bush bashing, but looks great on the road too. 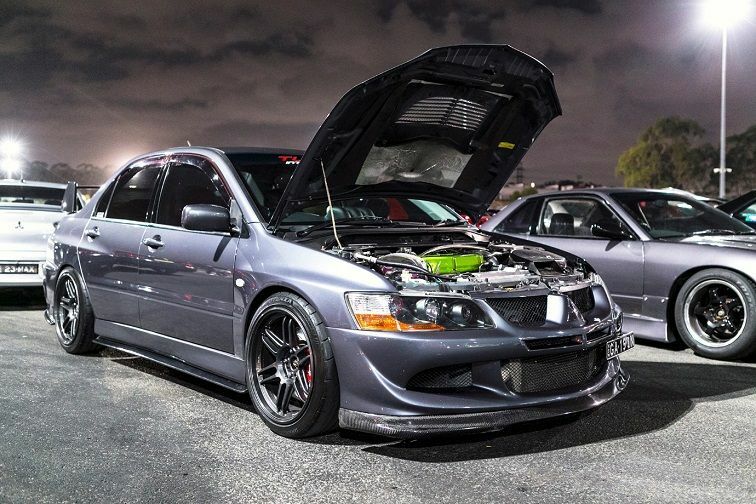 Josh tells us he’s got big plans for it once he’s off his Ps, something that involves an LS1 and a supercharger! 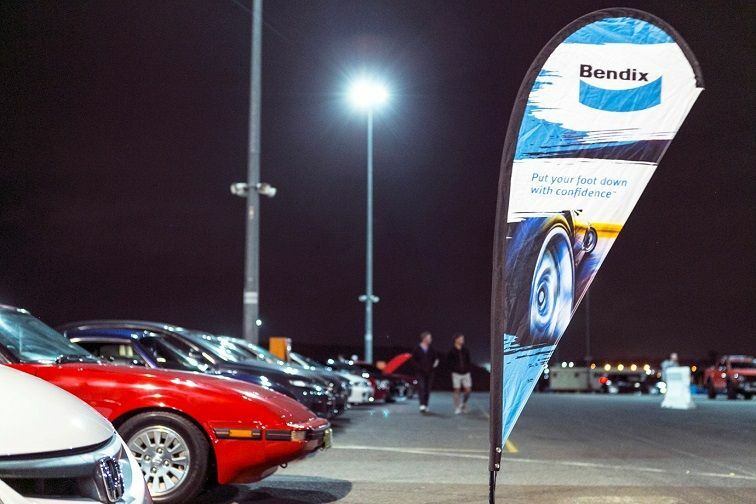 We are closet Subaru fans at Bendix so when the best looking Subaru that was sold in Australia rocked up, modified, and slammed, it had to be featured. Introducing Shaun’s Impreza WRX STi V5 coupe. Never again will there be a Subaru this perfectly proportioned. 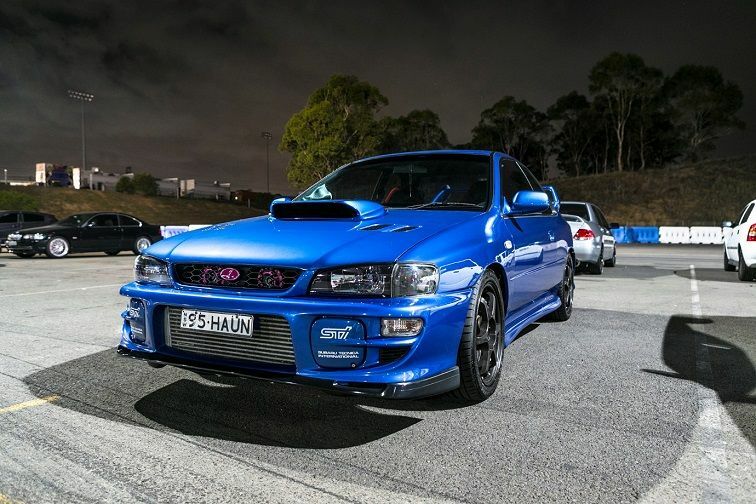 Toned, muscular, purposeful, Shaun decided not to mess with the classic GC8 look. Instead he’s focused on making the EJ20 super reliable and punchy. All forged internals were used in the refreshed EJ block. With a Blouch turbo replacing the trusty crusty VF28, the coupe knocks a very useable 220kW with heaps of torque. Tein coilovers, Brembo brake upgrades and the full Whiteline suspension catalogue ensures it handles as good as it looks. Arguably the best road going Evo ever made (the Tommi Makinen 6 is another contender), the Evo 8MR comes from factory with a better turbo, aluminium roof, and a re-programmed AWD that offers even more grip. Trust Dale to start with a great platform for mods then go all out and build it into a weapon. The beefy 4G63 is pretty solid from the get go, but to make 450kW means a full tear down and rebuilt with the forged aftermarket goodies. JE pistons, Brain Crower rods, fully rebuilt and cammed head, then dual-map tuned on E85 and 98 octane. Currently on a conservative tune making 310kW, the engine package was done at InHouse, while tuning was done at ISMR. It’s relatively more conservative on the outside, with tasty AME Tracer II wheels and carbon fibre side skirts, lip and rear pods. Our eyes are always peeled for something different...like a stripped out hatch back that focuses on lightness and pure naturally aspirated muscle. “Wait, Hondas aren’t different,” you say, but ha! This isn’t a Honda, it’s a Mitsi. Painted inside and out in an eye catching, yet subtle Golf R blue, the inside is stripped bare saved for the dashboard and two Recaro Pole Position seats. The asthmatic 1.6l stocker was binned in favour of a 2.4l MIVEC donk from the 2005 Lancer. 120kW at the wheels may seem laughable in the time of 300 average killer wasps, but it’s nothing to sneeze at in a car that weighs under a ton. Sticky Toyo R888R rubber wrapped around 15x8 Enkei RPF1s ensure that power runs out before grip does. Still running in, Helio hopes to make 150kW naturally aspirated. Don’t be surprise when this Mirage disappears in front of your eyes. 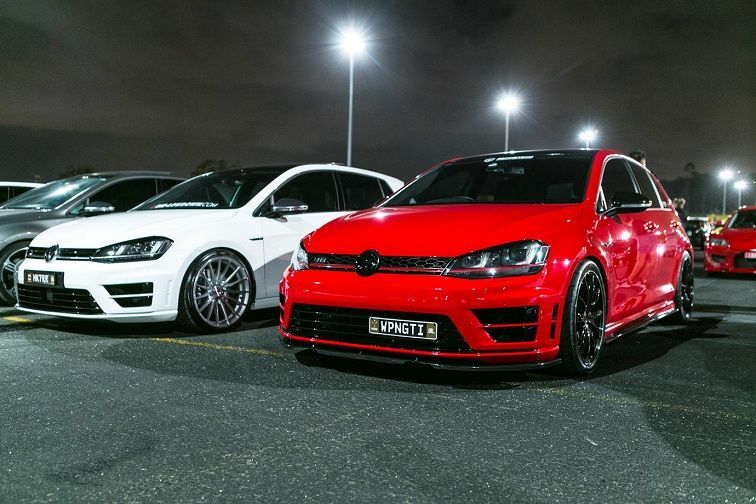 The Golf GTi has always been styled as the everyman’s performance car. It’s got the hot hatch formula down pat; everyday usable car that can turn into a mountain road weapon instantly. The GTi can be all those things and more; and more is exactly Dave has gone for. More power. More grip. More low. So basically, more speed. It’s his tuning company, Pacortech’s demo car, it’s a showcase of what can the modern turbocharged Golf can do. The stock engine’s ECU has been given a stern talk by Underground Performance, and as a result chucks out 280kW at the front wheels. With some help of a bolt on Hybrid turbo kit, a DSG Milltek catback, and CTS down pipe, of course. Helping it haul up are front brakes pinched from the Audi TT-RS, required to haul up at the end of a 12sec flat quarter mile run. We'll have more Fords in the next one! Promise.